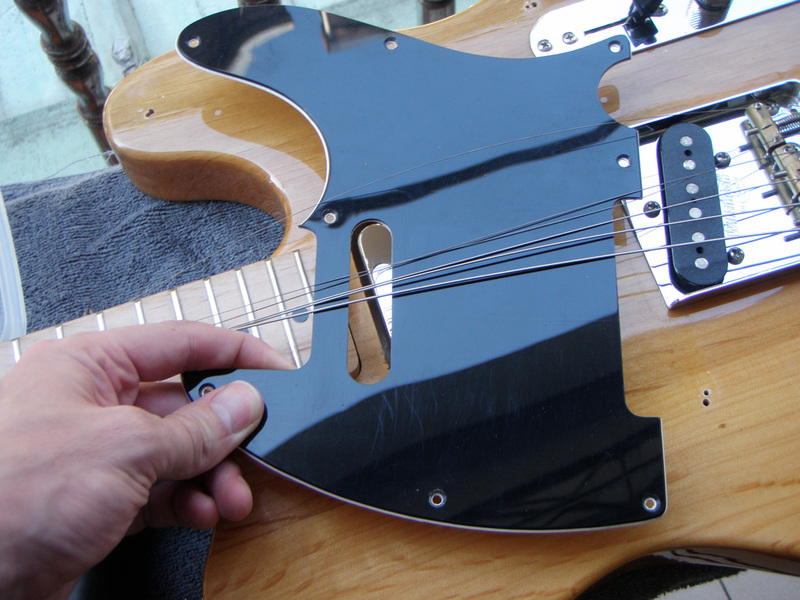 The neck pickup on this Telecaster needs to be raised. 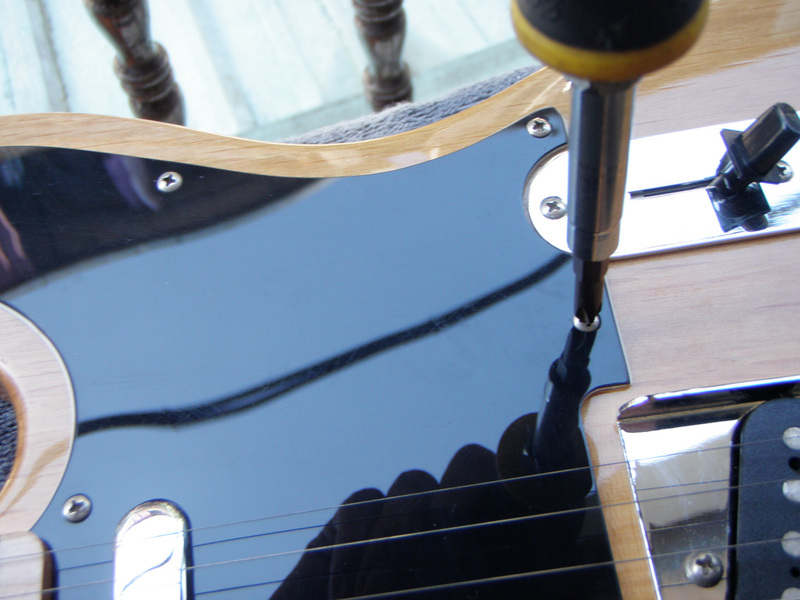 However, as is the case on most Telecaster-style guitars, there are no height adjustment screws in sight. There is a way to adjust this, but it’s not entirely obvious. Although the following steps might seem like a lot of work, you can easily do this in 20 or 30 minutes. 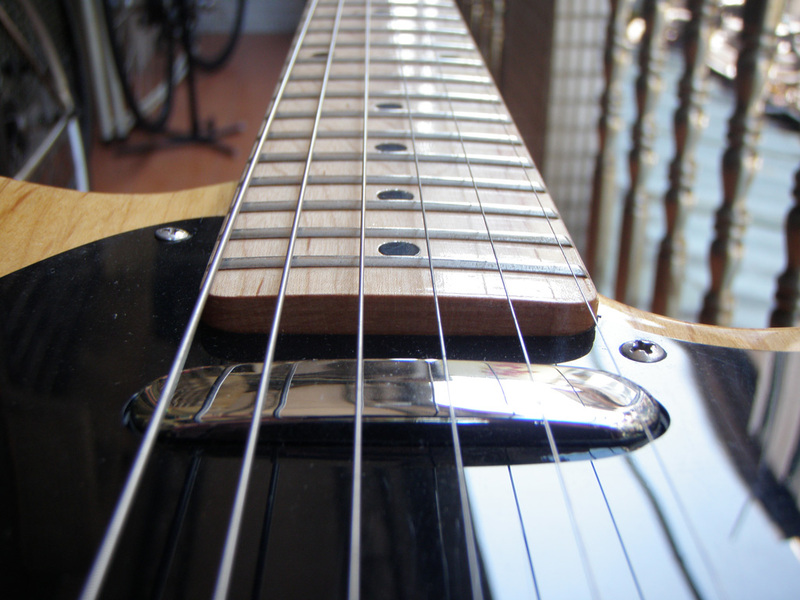 Before starting, you should really ask yourself why you want to adjust the pickup height. A common mistake is to think that if you move the pickup as close as possible to the strings, you can get a more powerful and better sound. 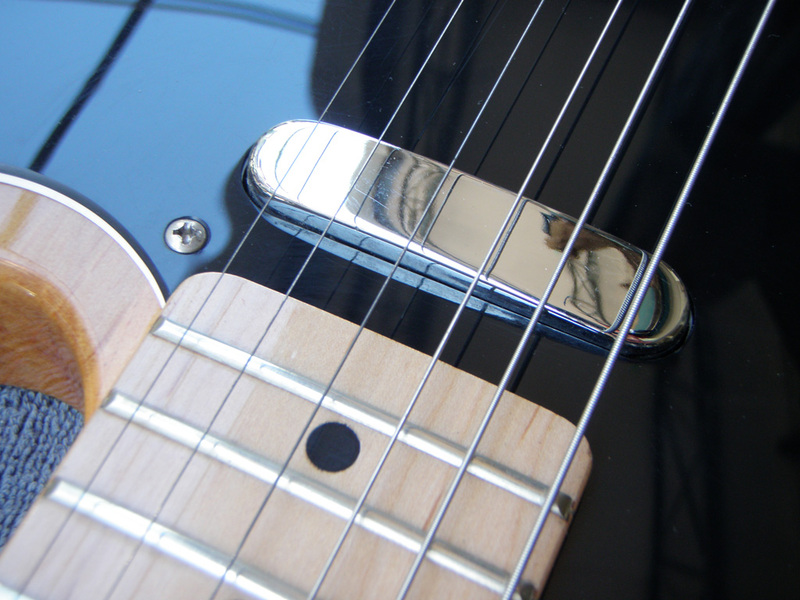 However, as you move the pickup closer to the strings, the pickup magnets can start to influence the strings themselves, even dampening them and affecting the sound in a bad way. For this reason you need to be careful not to raise them by too much. The pickup on THIS guitar is noticeably low and the output is much quieter than the bridge pickup. I could lower the bridge pickup instead, but I already like how it sounds and don’t want to mess with it, so I’m going to raise the neck pickup. Before continuing, let’s take some measurements. Press down on the last fret of whatever string you want to measure and then use a ruler to deduce the distance between the pickup and that string. Do this for both of the E strings and also measure one of the middle strings. 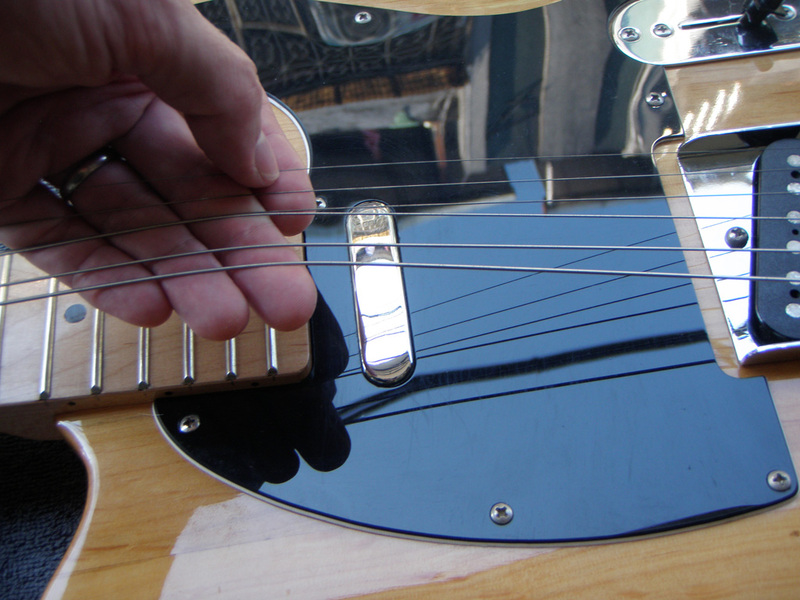 The reason you need to measure one of the middle strings is that, since this particular pickup is curved on top, it could be closer to the strings in the middle than at the edges. What you don’t want to do is adjust it nicely at the edges only to find that it ends up far too close in the middle. After measuring this pickup we find that we have a good 4 mm at each E string and just under 4 mm in the middle, so the plan is to raise it up by 2 mm at both ends. First thing we should do is slacken the strings. You might be able to get away without doing this, but it certainly makes things easier. Now remove all of the screws holding the scratch plate (pickguard) in place. Lift up and remove the scratch plate. The pickup will stay attached to the guitar, so make sure you take this into account as you lift out the scratch plate. 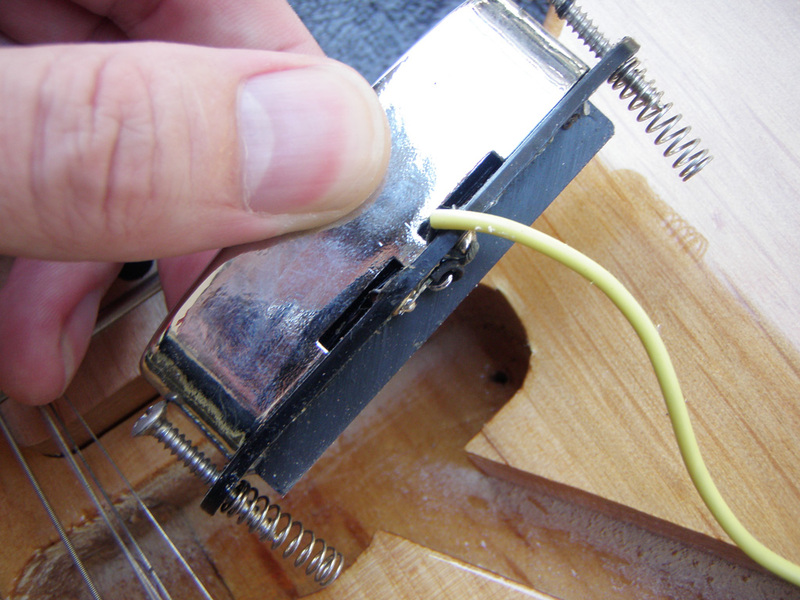 You will now see that the pickup is screwed into the body of the guitar with two screws. 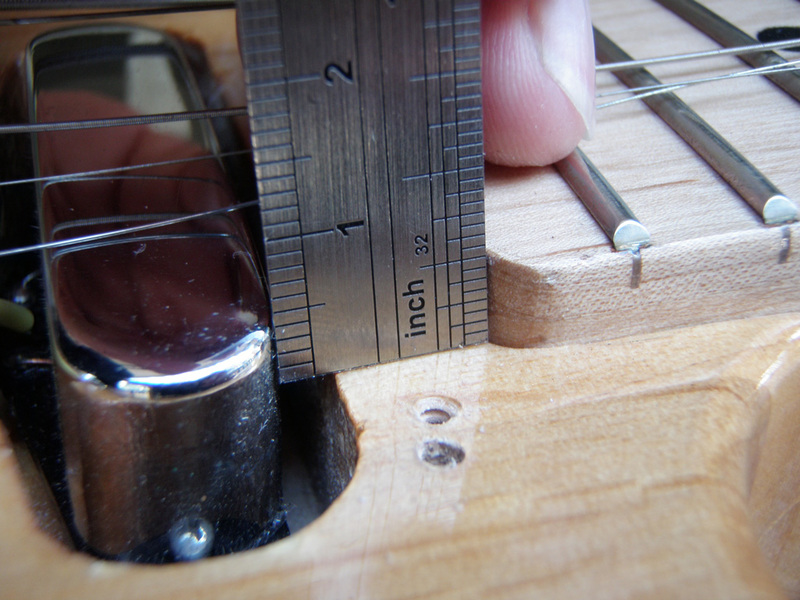 Before making any adjustments, it’s time to measure the pickup height again. That way, after we make any adjustments, we can measure how much the pickup has moved (since we’ve slackened off the strings, we can’t compare to our previous measurements now). This pickup is measuring approximately 4 mm above the guitar body at both ends. Remember that the plan is to raise this one by 2mm at each end, so we will raise it to 6 mm above the guitar body. Although not necessary here, I have unscrewed the pickup completely just to show you what we’re dealing with. As you can see, there are two springs on the pickup screws. This allows you to adjust the height by simply turning the screws. 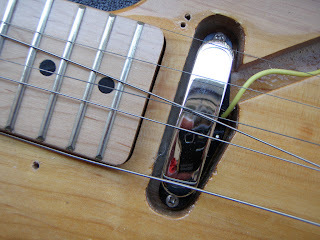 Some Telecasters do not have these springs, however, and if that is the case for you, I recommend adding some now. Otherwise you will only be able to raise the height by propping something under the pickup, such as washers or coins. A cheap and simple method is to steal the spring out of a cheap ballpoint pen, cut it in half, and slide one half over each of the screws, although if you prefer you can get proper pickup springs or tubing from any number of sources. 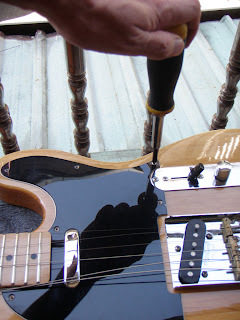 Rotate the screw at each end to adjust the height (anti-clockwise [counterclockwise] to raise the pickup and clockwise to lower it – note that this is the opposite to most pickups). Keep measuring the height after each adjustment until the pickup is where you want it. 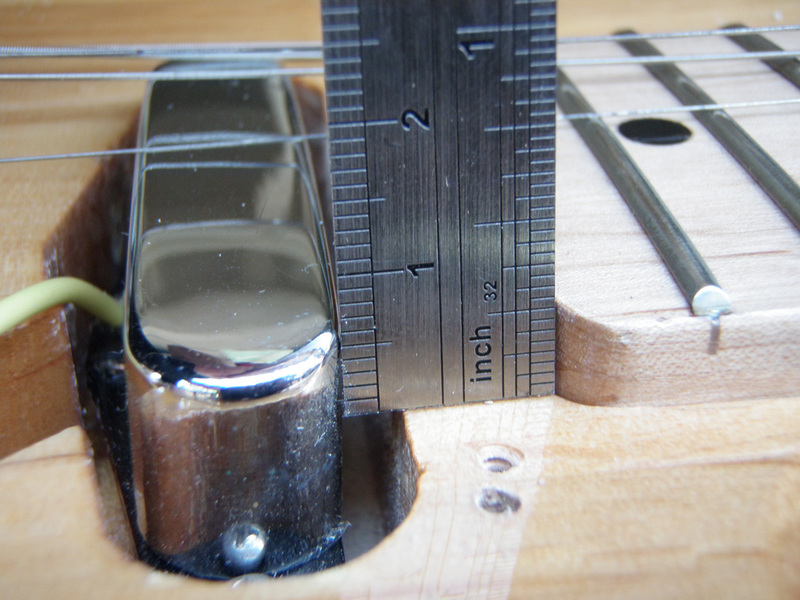 Remember that in THIS case the plan was to raise it by 2mm, so we want it to sit 6mm above the guitar body. Your guitar will most likely be different. If you want to experiment a bit, you could tighten your strings again and play a while to try out the new pickup height. Once you’re happy, you can replace the scratch plate. In this case, we already have the pickup height we want, so I’m going to go ahead and replace the scratch plate now. If you haven’t already done so, tighten up the strings and enjoy your guitar's new sound! Nice post. I found it because i am having trouble on lowering my neck pickup. 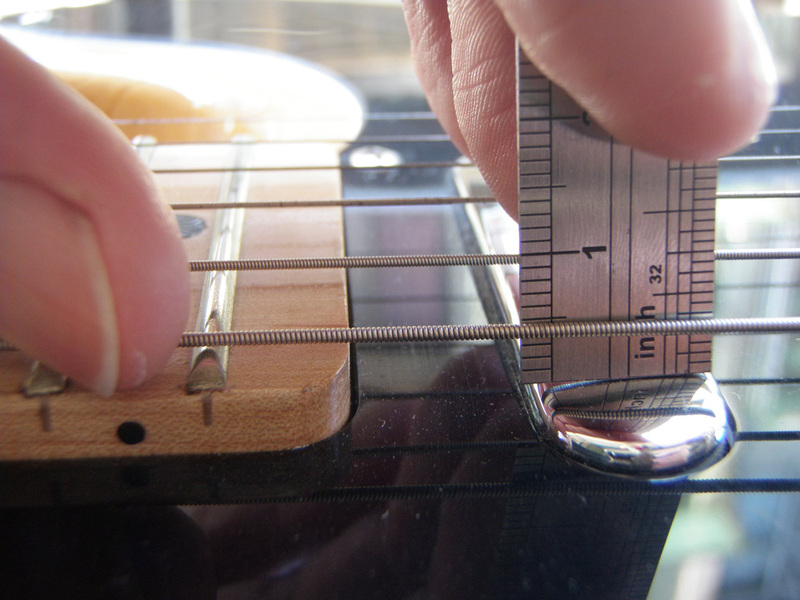 I can't get it under 2 mm on the low side and 1,5 mm on the other (strings fretted). I wish i could at least get to the fender manual settings (2,4/2,0). The screws won't go any further. They seem to be at their limit, specially at the upper E. Have you seen that happen? Have any ideas of what i am doing wrong? What is the exact tool to do it? Do you know how low that pickup can get? Sorry about all those questions and about my english, but i'd be really glad if i could get some help on that. I've tried to adjust the neck pickup on my tele but the pick guard goes under the neck almost rebated under there. The only way I can get to the pickup screws will be by loosening the neck screws. Does this seem the correct way to go. Hi Eric, it sounds like you have a 22-fret neck there. Since originally they came with 21 frets, and pickguards were cut accordingly, 22-fret necks generally come with the 22nd fret "overhanging", which is to say it hovers over the pickguard rather than the pickguard being cut around it. Otherwise you'd need a differently shaped pickguard and, more importantly, a differently cut neck pocket on the guitar body. It's a clever solution, but of course it means that you can't lift the pickguard out so easily. The neck shouldn't really be causing any pressure on the pickguard itself, since this could cause the 22nd fret to be pushed up, so in theory you should be able to slide the pickguard out back the ways (towards the bridge). You will of course have to lift the pickguard up slightly at the bridge itself no order to let you move it in that direction. If this doesn't work (maybe because the strings are getting in the way) then you may have to remove the strings completely. 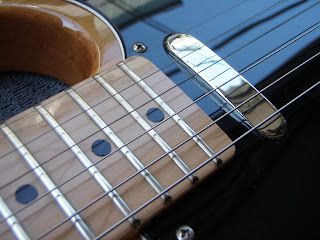 If the fretboard is really pushing down on your pickguard then I guess there is no option other than to loosen the neck screws, although really this shouldn't be happening (in my humble opinion of course). 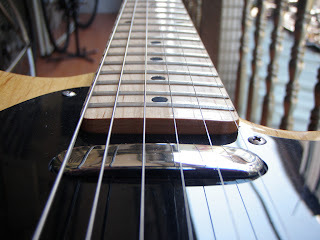 Hi Stu, I have raised the neck pickup about 2 mm and it sound great and the same volume as the bridge pickup. The pickup was screwed to the body with a couple of rubber supports. I replaced the supports to give a bit more height for the pickup. I undid the neck screws, did the job and put everything back and the tele sounds great now. Thanks for the advice and really the confidence to do the work. Many thanks again, Eric. Hey Eric, that's great. Congratulations and thanks for letting us know how you got on. Like Eric my tele has a 22 fret neck. It is necessary to loosed the neck screws to easily remove the pickguard. Ballpoint pen spring idea is brilliant!